All Wheels Up is a nonprofit dedicated to making air travel accessible to those with wheelchairs. Currently, they need to be lifted out of their wheelchairs–literally lose their legs–and hope that the airline will not damage or even lose their wheelchair. Anyone who has flown knows what a hassle it is to arrive without luggage, but imagine if that was your legs. All Wheels Up is working to persuade airlines to create spaces for wheelchairs like buses and trains have: an occupiable seat that can lift up and securing straps can accommodate someone in a wheelchair. Alan Chaulet himself is an entrepreneur with other projects as well. Among them, a drone which allows people to virtually attend conferences from the comfort of their homes–not only watch the presentations but move about as they please, talk, and exchange virtual business cards, and another project to provide support for other disabled entrepreneurs. 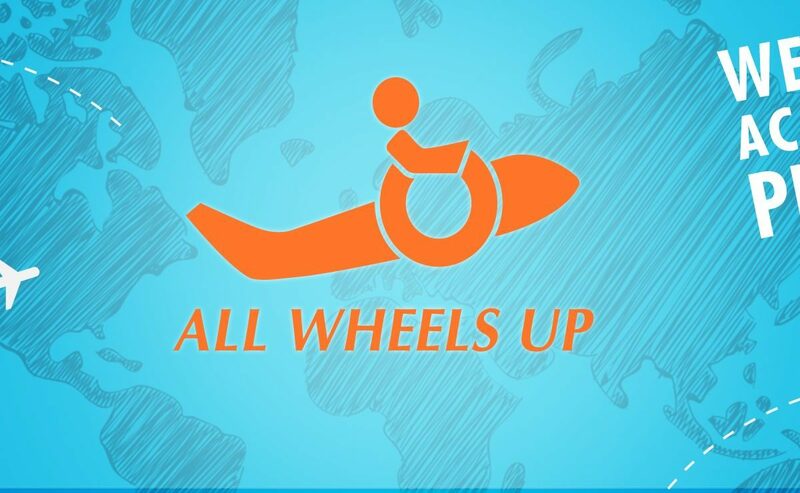 All Wheels Up can be found at allwheelsup.org. Alan Chaulet: Right now, if you have a wheelchair, flying on an airplane is a nightmare because you have to get out of it even though it literally is your legs, and it costs tens of thousands of dollars. Right now, airplane travel…you really have to be incredibly brave to fly, with your wheelchair ‘cause so many times they get damaged and even lost. Alan Chaulet: Air travel is gonna double in the US in the next 20 years. Alan Chaulet: Right now, the only disability regulation that they’re dealing with is something called the Air Carrier Access Act, and that was passed in ‘86 and basically just says that airplanes can’t discriminate against people with disabilities. So it’s like they can give us tickets but they can’t give us much else. Alan Chaulet: I always wanted to be an entrepreneur since I was six years old. Alan Chaulet: When we started off we got a contract with the company that makes the existing wheelchair restraints that are used on buses and taxis so what we’ve been doing is doing crash tests to show that they can meet the regulations for flying on airplanes. Alan Chaulet: Right now, entrepreneurs with disabilities, they have some great ideas but they’re constantly overlooked and they need help becoming businesses. Alan Chaulet: Right now in Boston, the MBTA buses…you lift up the seat and then the wheelchair tie downs are right down there.